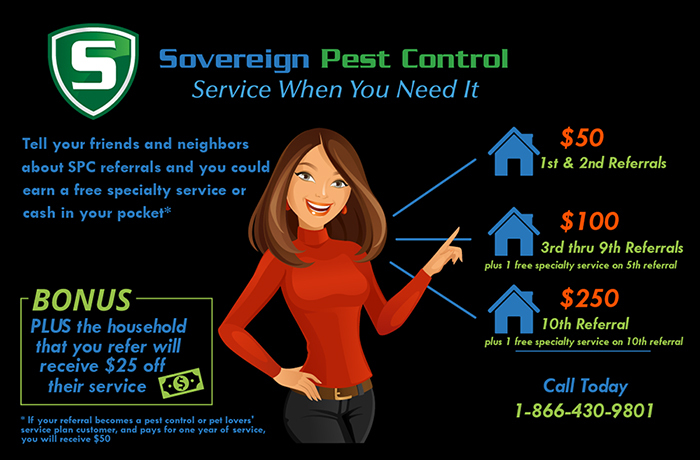 Sovereign Pest Control offers a Double-Sided Escalating Referral Program that will reward $50 to $250 for those who refer a friend, neighbor, family member, acquaintance or client that becomes a Pest Control or a Pet Lovers’ Service Plan client. In addition, the homeowner you refer will receive a $25 discount on the purchase of the Pest Control or a Pet Lovers’ Service Plan. Specialty Services include (Mosquitoes, Fly Prevention, Bee, Hornet & Wasp Removal, Pantry Pests, Stink Bugs, Box Elder Bugs, Cicada Killers, Fire Ant Service, Outdoor Party Service, Yard Service & Pet Lovers Service). Sovereign Pest Control’s Refer a Client program allows individuals who have homeowner clients a $50 referral fee when a referral becomes a termite and pest control service plan customer. Refer a Client annual service plans include termite inspections, termite treatments to active and infested areas, WDI reports and unlimited pest control extermination treatments. In addition, Sovereign Pest Control offers a variety of Specialty Services. Specialty Services include (Mosquitoes, Fly Prevention, Bee, Hornet & Wasp Removal, Pantry Pests, Stink Bugs, Box Elder Bugs, Cicada Killers, Fire Ant Service, Outdoor Party Service, Yard Service & Pet Lovers Service). With no limit on your ability to earn; start spreading the news to clients, friends, relatives, co-workers and neighbors! The more you refer, the more you earn. Don’t delay, call today and get started now! All you have to do is submit the information on the referral programs’ form or call one of our pest control representatives 1-866-430-9801. For residents in Maryland and Virginia click here for customer service information.